According to the Centers for Disease Control and Prevention, around 480,000 Americans die annually from diseases attributed to cigarette smoking, with more than 41,000 of these deaths from exposure to secondhand smoke. It is estimated that smoking-related illness in the United States costs more than $300 billion a year. Cancer, heart disease, stroke, and emphysema are among the most well-known and feared effects of smoking. Other associated problems include chronic bronchitis, musculoskeletal disorders, diabetes, digestive disorders, erectile dysfunction, reproductive disorders, complications of pregnancy, and depression. Because of the health hazards associated with tobacco use and other concerns, nearly three-quarters of current smokers want to quit. Breaking free from nicotine addiction, however, is not easy. According to various studies, former smokers often make three, four, or many more attempts before they finally succeed in achieving smoking cessation goals. 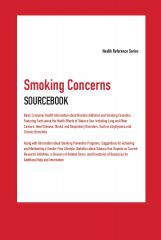 Smoking Concerns Sourcebook, Second Edition provides basic consumer health information about nicotine addiction and smoking cessation, with facts about the health effects of tobacco use, including lung and other cancers, heart disease, stroke, and respiratory disorders such as emphysema and chronic bronchitis, along with information about smoking-prevention programs, suggestions for achieving and maintaining a smoke-free lifestyle, statistics about tobacco use, reports on current research initiatives, a glossary of related terms, directories of resources for additional help and information, and an index. Part I: Smoking and Tobacco Products: An Overview provides facts about various tobacco products such as cigarettes, cigars, pipes etc. It describes the different types of chemicals present in the tobacco products and explains how addiction develops. Statistical information about trends in tobacco use among specific population and economic costs of smoking are also included. Part II: Tobacco-Related Health Hazards discusses the diseases and disorders that can be caused by or worsen as a result of tobacco use. These include various types of cancer, respiratory disorders, and cardiovascular diseases. Hazards associated with smoking during pregnancy and the effects of smoking on the digestive system, musculoskeletal health, oral health, and sexual functioning are also explained. Part III: Smoking Cessation provides information about how to quit smoking. It outlines the recommended steps for preparing to quit an various health benefits of quitting. It also elaborated what to expect during the first few days of a cessation program, and offers tips for coping with commonly experienced problems such as stress and depression. Nicotine replacement therapy and other medications that can help people achieve smoking cessation goals are also described. Part IV: Tobacco-Related Research reports on areas of current investigation into how nicotine addiction develops, the health-risks associated with tobacco products, and strategies to lessen the impact of tobacco-related damage on body organs and systems. Part V: Tobacco Control and Use Prevention explains various public health policies used to reduce tobacco consumption, including programs to restrict minors’ access to tobacco, clean indoor air regulations, taxation policies, counter advertising campaigns, and tobacco labeling requirements. Part VI: Additional Help and Information includes a glossary of terms related to tobacco use and smoking cessation, a directory of resources for tobacco-related information, and a list of resources for help with smoking cessation. Includes access to Health Reference Series Online.